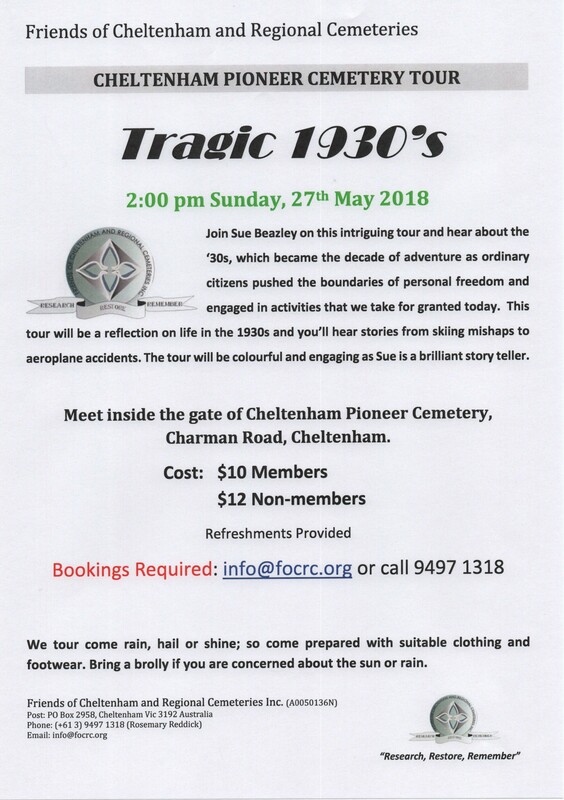 Cheltenham Pioneer Cemetery Tour – Tragic 30’s Tour – CANCELLED – South Eastern Historical Association Inc. UNFORTUNATELY, DUE TO LACK OF BOOKINGS, THIS TOUR HAS BEEN CANCELLED. 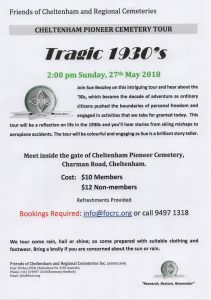 Friends of Cheltenham & Regional Cemeteries invite you to their Cheltenham Pioneer Cemetery Tour – Tragic 30’s Tour. This tour is a reflection of life in the 1930s and you will hear stories about skiing mishaps, sailing accidents, the death of a jockey, murder suicide, a one punch death and an aeroplane accident. Join Sue Beazley and her fantastic group of volunteers for an intersting and reflective tour. When: Sunday, May 27 at 2.00pm. Meet inside the gate of Cheltenham Pioneer Cemetery, Charman Road, Cheltenham. Cost: $10.00 Members $12.00 Non-members. Refreshments Provided. Bookings Required: info@focrc.org or call 9497 1318.